Good thing that this was a practice run, not a competition! Beamer is a ‘Starters’ (beginner) agility dog owned and loved by Smith of TailBlazers Agility Training. 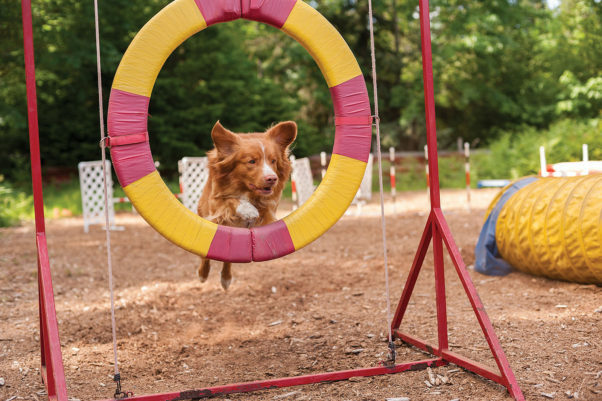 A canine agility enthusiast for more than 13 years, Smith firmly believes that to excel in the sport, it must always be fun for both the dog and the handler. Beamer is a great example of a dog that has learned fun first, focus second. With further training and an investment of time (and patience) Smith has no doubt that he will excel in the sport, just like her other Masters level agility dogs. 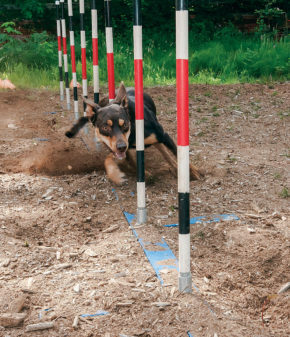 Canine agility is designed similar to equine show jumping—without the saddles, bridles and riders—and is a race for time and accuracy. The height of the jumps—from six- to 26-inches—and angle of some obstacles is adjusted according to the height, age, and breed of dog, as well as their experience. Competition levels include Starters, Advanced, and Masters, and within that there are divisions for Veterans and Specials. (‘Specials’ are dogs of any age that would jump at a lower level due to physical limitations.) The basic premise is that the handler must direct an off-leash dog through an obstacle course using only hand signals, body language, and voice commands. While food, toys, and touching may be utilized as incentives during training, they can’t be used during competition. Agility dogs also run ‘naked’ for safety reasons—no collars are allowed in competitions. The first widely documented demonstration of dog agility was at the famous Crufts Dog Show in the United Kingdom in 1978. It was developed as a form of entertainment between obedience and conformation classes, to showcase dogs’ natural speed and agility. The concept of having dogs jump over, run through, and climb obstacles builds on their primeval instincts to run and jump in pursuit of game. That first demo wowed the crowd and caught the attention of dog fanciers from near and far. The concept grew faster than a border collie chasing a tennis ball. In 1980, The Kennel Club in the United Kingdom became the first organization to officially recognize agility as a sport. Agility came to Canada soon after and became ‘official’ in 1988, when the Agility Dog Association of Canada (ADAC) was formed. The name eventually changed to the Agility Association of Canada (AAC), and this is the predominant agility group governing the sport here. Competitions are also offered through the UK, Canadian and American Kennel Clubs, and the US Dog Agility Association. Pate’s legacy lives on with a couple of hundred people in the Comox Valley who train, practice or compete under the direction of four different training groups every week. Classes run for four or six weeks and cost about $18 per one-hour lesson for all levels, for dogs of all ages, breeds and abilities. Due to their speed, trainability, intense concentration, and athletic prowess, border collies dominated the agility trials in the early days. While still a popular choice for hard-core competitors, other breeds—especially herding and field breeds that have been bred to move quickly—are proving to be equally competitive. Jack Russell terriers and several dog breeds from ‘down under’—Australian shepherds, kelpies, and cattle dogs—are giving border collies a run for their money. In fact, almost any breed, from Chihuahuas to chow chows (and everything in between) can be trained in agility. Some of the longer-backed dogs, however, like dachshunds and basset hounds, and heavy-set dogs, like American bulldogs, may find agility too physically demanding. Some of the giant breeds may also have trouble with the tunnel, teeter-totter, and dog walk because the obstacles are ‘one size fits all’. Imagine trying to run a 180-pound English mastiff through a 24-inch diameter tunnel! You should also know that you don’t have to have a purebred dog to do agility. Or a fast one. Crossbreeds are welcome and they are referred to as ‘All Canadians’. In fact, many of today’s top agility dogs are ‘mutts’. Glenn Tiede of Team Agility Group (TaG) has a feisty little Jack Russell terrier crossed with a border collie. (Read as ‘tenacity and drive crossed with speed and intelligence’!) The Black Creek duo recently earned a coveted spot on the Canadian Agility Team for the World Agility Open Championships in England. They won first place in the Bonus Speedstakes event. 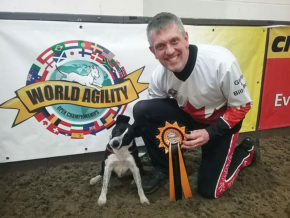 Glenn Tiede and his dog Billy Bob recently competed on Canadian Agility Team for the World Agility Open Championships in England. As a genuine demonstration of the bond that forms not only between the dogs and their handlers but of the agility community as a whole, participants in ‘competing’ groups banded together to help Tiede and Billy Bob get to England. Fellow competitors made dozens of donations to a silent auction held in April, with the money raised going to help pay for the duo’s trip across the pond. Tiede says that attending the ‘Worlds’ was a lifetime highlight. As far as the age of dogs that can be trained in agility, the basic rule is that dogs under 12 months of age should not be allowed on the contact obstacles nor should they be allowed to jump. Growing puppies could cause irreparable damage to bones and ligaments by jumping to high too soon, twisting through the weave poles, or clambering over obstacles. Starting classes prior to a puppy’s first birthday would be for socialization, and to understand the concept of going between the two upright parts of jumps, and to learn basic commands. If your dog is well past the puppy stage, rest assured that you can teach an old dog new tricks. All of the trainers interviewed said they welcome older dogs in classes. If you have any concerns about your dog’s agility ability due to existing health problems, talk to your veterinarian. In competitions, all dogs over the age of seven years have the option of being moved into the ‘Veterans’ category, so they are jumped at a height one level below that of a younger dog of the same size. People of all ages can learn agility, too. Most training groups have special classes for kids and you will find people of all ages in any class. Even if you don’t have a dog, you can still get involved in agility. Volunteers are essential to the smooth running of any competition, and you may also be of help during classes. If agility sounds like something you might like to try, but you are terrified at the thought of competition, don’t worry. Not everyone wants to own a dog as high drive as Billy Bob or Beamer. And you don’t have to compete to enjoy the sport. Many people participate in classes without any intention of ever entering trials or working toward a championship title. The bottom line is that agility is about having fun, getting exercise, making friends, and building a strong dog/owner bond. If you would like to watch an agility class or attend a trial as an observer, you are usually more than welcome. For classes, contact the trainer for permission. And even though your dog is probably quite lovely and well behaved, please respect agility etiquette and don’t bring your dog to observe a trial or class. For their safety during the hot ‘dog days of summer’, please leave your dog at home where they are protected from the heat and won’t be a distraction to classes or competitions. Incredible Canines is owned by Joanne and Dave Collis. They teach indoor and outdoor classes 10 months of the year at their acreage in Black Creek. They occasionally host fun meets that are open to others, not just students. Call 250-337-8383 or email jdco@telus.net. TailBlazers Agility Training was established in 2005 and holds classes in both Campbell River and the Comox Valley. Owner Kathy Smith typically hosts four trials a year. The next ones are August 13 and in November. Call 250-703-1077 or email morgan.3@live.ca.